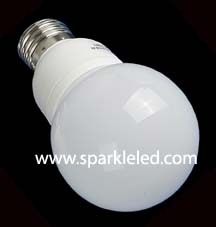 Characteristics︰ Sparkleled company's LED Spotlight uses super bright LEDs with the chips from Taiwan. The bulb lamp uses frosted milky white glass cover in order to make the effect of 7 colors changing. Without the outside controllers, the built-in IC controls the color changings such as slowing moving, quick flashing. We can also adjust the changing time according to your needs. Application Areas︰ The LED bulb lamp is the ideal lighting sources for the advertising board, the show board outside the bar and the hotel, the outlook of the wall of building, the lighting project for the resorts, the decoration of stage, home decoration, coffee house etc.